Hello friends and fellow travel-lovers! It’s now been a month since my European adventure traveling through Amsterdam, Brussels, and Paris. 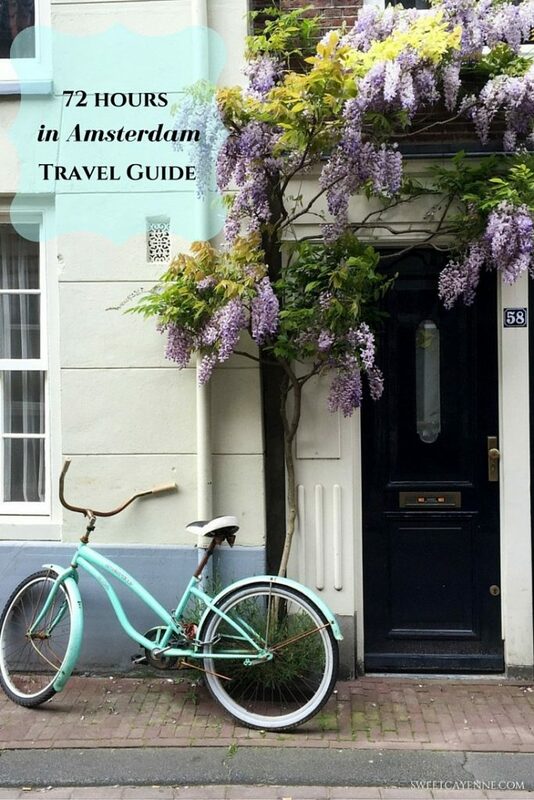 I’ve finally been able to organize my thoughts/pictures of the trips and am excited to be sharing a guide to Amsterdam. This was the first city we visited and we had 3 days to explore it. I’ve compiled a day-by-day guide that highlights our favorite parts of the trip, where I’d stay if I went back, where to eat, and what to do. Enjoy! The Jordaan neighborhood is the Jewish quarter of Amsterdam and, after visiting it, I really wish this is where we had stayed. It’s located in the northwest side of the city center and just far enough from the hustle and bustle that you can feel relaxed but close enough to walk to all the highlights of the city. I loved the quaint shops and tiny restaurants scattered throughout the neighborhood – in fact, all of my favorite restaurants we ate are located here. It’s a great place to call “home base” during your stay and there are plenty of apartments, B&Bs or hotels available to choose from. 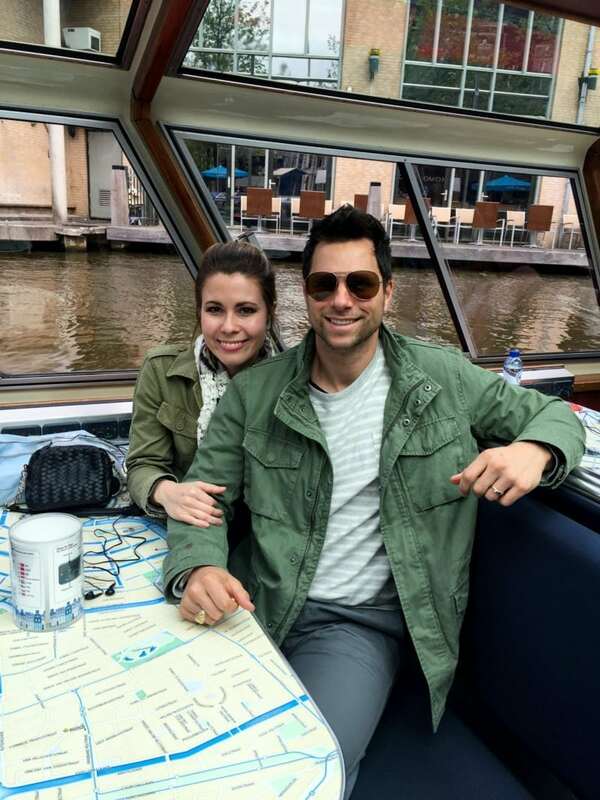 Amsterdam has great public transportation; and both Ryan and I were so impressed with how clean and easy-to-navigate the GVB system was. I’d recommend buying a 24, 48, or 72-hour card that provides unlimited use for the buses and trams. You can easily access online maps of the lines and timetables for GVB. Also, this amazing guide to the tram stops gives you options for what to see and do for each stop. 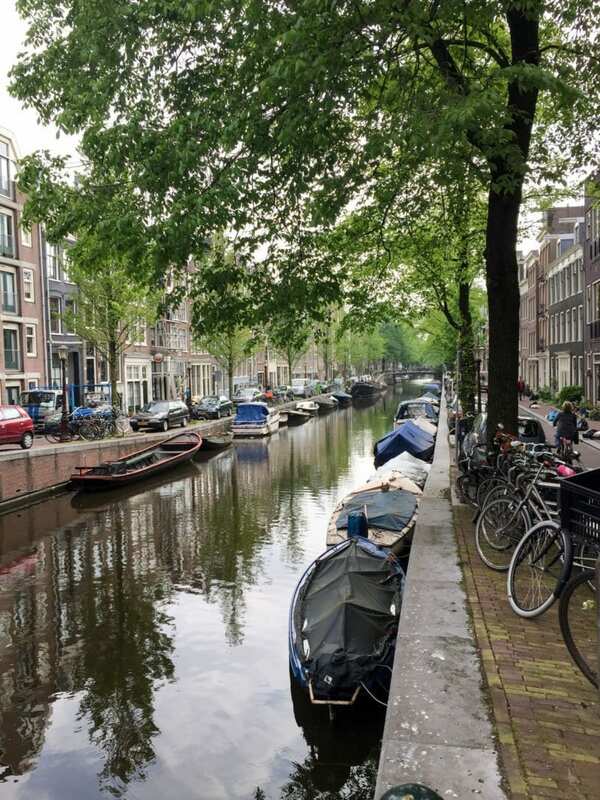 Whether you arrive in Amsterdam in the morning or the night before your first full day, I’ve always found it best to plan something low-key for the first day of a trip. 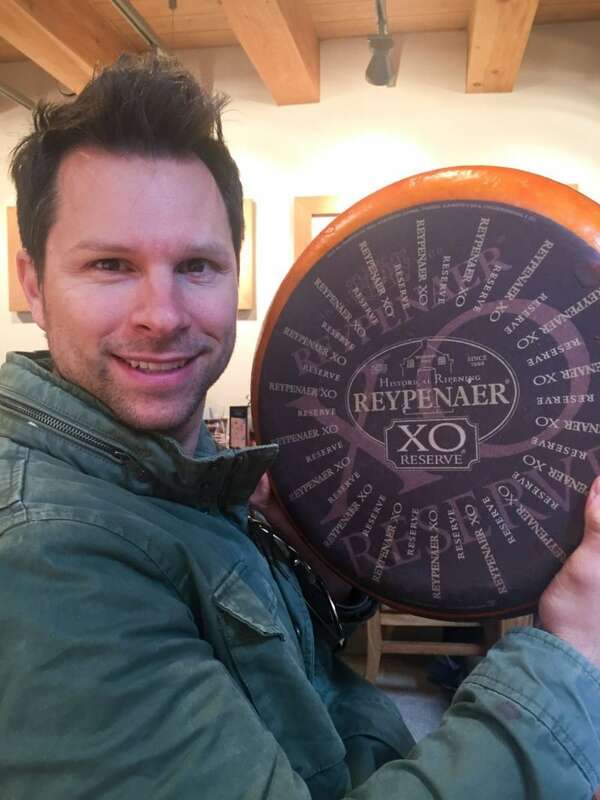 For our first day in Amsterdam, I booked a Reypenaer Cheese Tasting + Canal Tour. 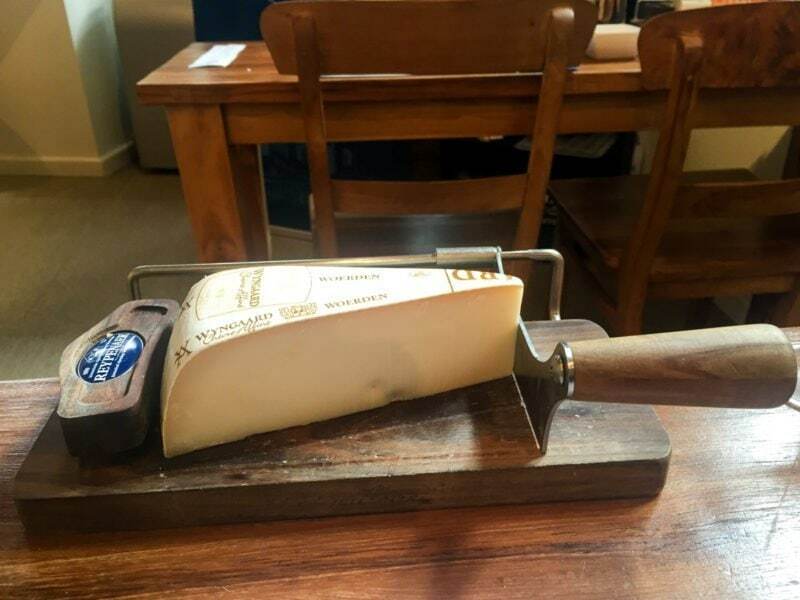 The cheese tasting was a one hour, all-you-can eat experience in the famous Reypenaer tasting room. 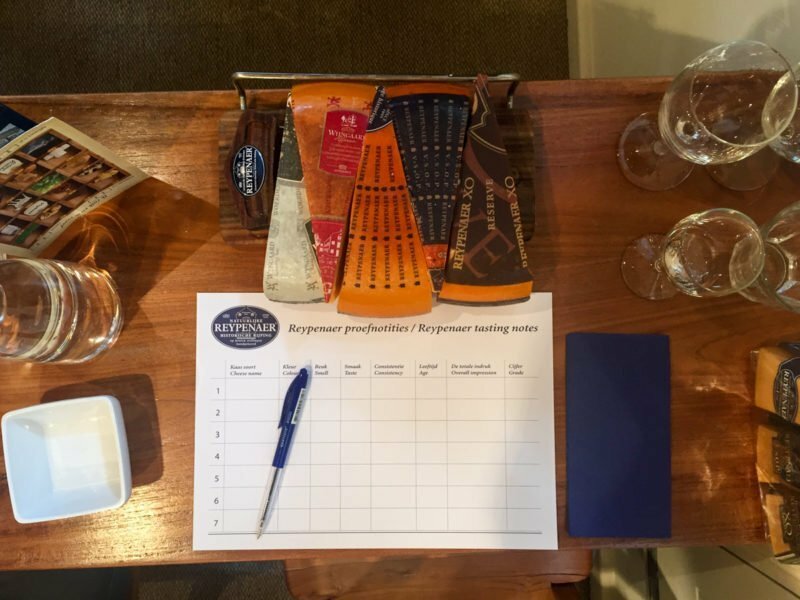 All the cheese were variations of Dutch gouda, and were paired with samples of red wine, white wine, and port. 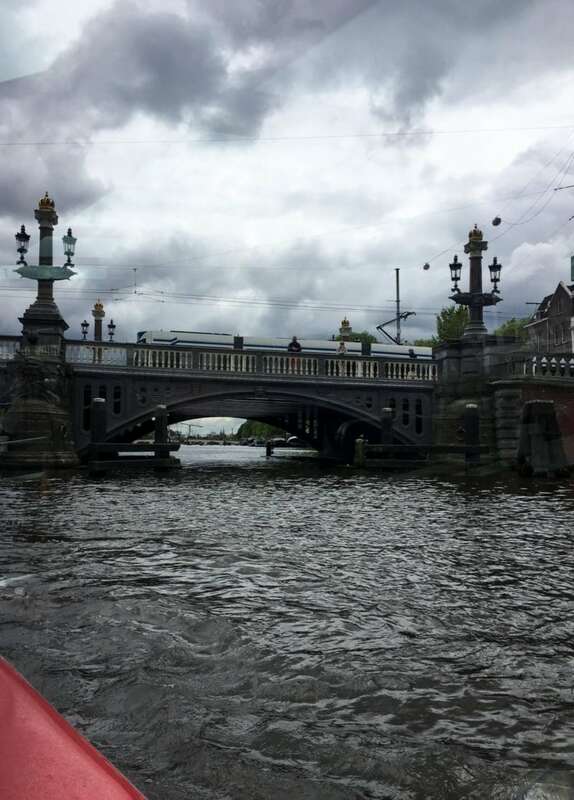 When paired with a one hour canal tour, the cost was €22,50 per person, which I found to be a great value for all that was included! After stuffing ourselves with cheese we walked about a 15-minute walk to the canal tour site. The boats are heated inside when it’s cold and have roofs overhead, so this is a good activity for any type of weather. Narration for what you are seeing is provided via ear phones on the tour. 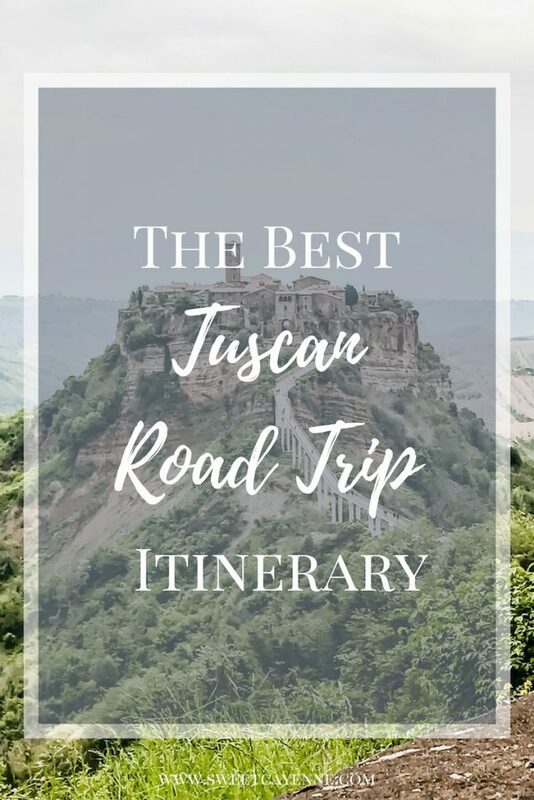 We loved this experience and felt that it helped us orient quickly to the city; as well as get an overview of the history. If you do happen to stay in the Jordaan area, I’d recommend dinner at Indian Sky. We had our first meal in Amsterdam here; and after a cold, damp day the warmth of the food here was just what we needed! 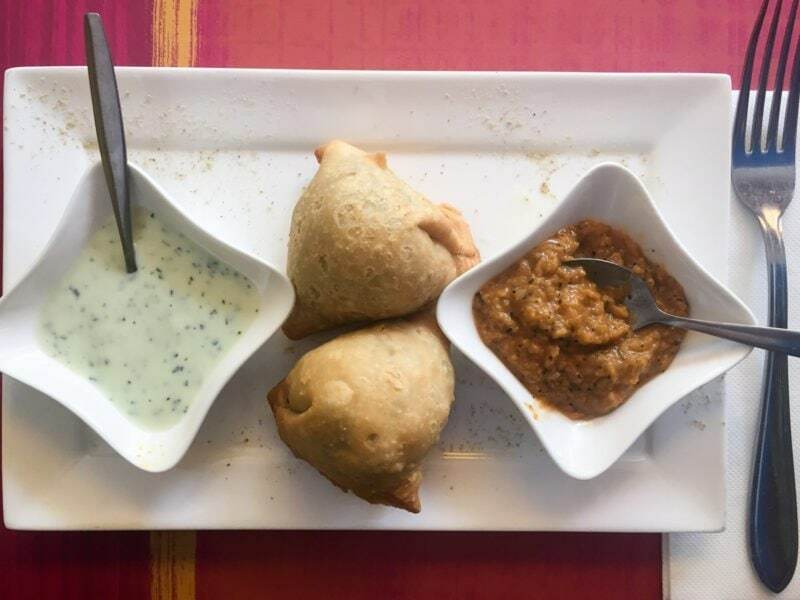 The food was some of the freshest, most flavorful Indian cuisine I have ever had – I was amazed at how high-quality the ingredients were. 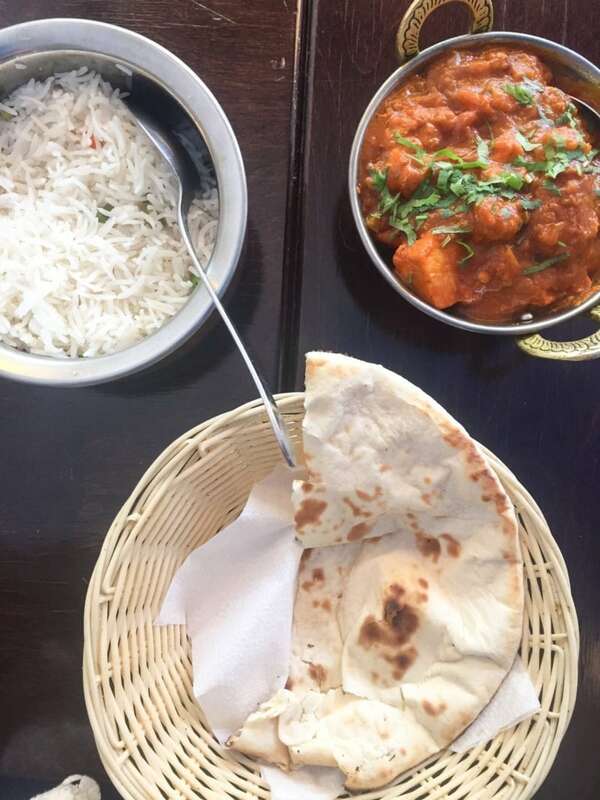 We got potato-stuffed samosas for an appetizer and then split the Chicken Tikka Masala for our entrée with a side of searing-hot naan bread. It was truly delicious and I would definitely visit again if I go back to this city. Morning: Anne Frank House €9,00 per adult – this is a MUST SEE if you are ever in Amsterdam and was probably my favorite thing that we did during our time here. The museum has a new policy that it only accepts online ticket holders from its opening time until 3:30pm, then it’s a free for all with often long lines. Save yourself some time and book online for an early morning time. Also, keep in mind that the online tickets sell out pretty fast – I’d recommend booking 6-8 weeks before your trip. 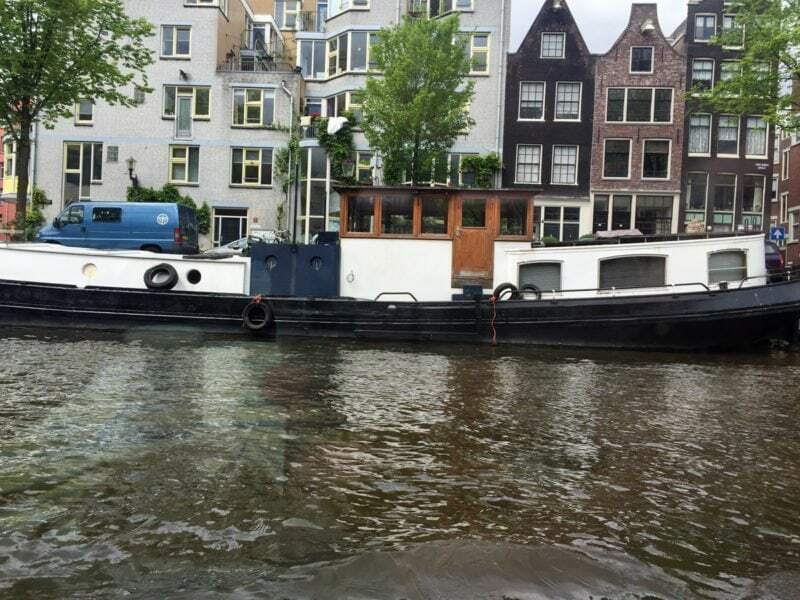 In the picture below, the Anne Frank House + museum is in the left of the photo. The church on the right is the one that Anne mentions in her diary when she would listen to the bells ring from the attic window. Seeing this in real life was such a moving experience that I will never forget! 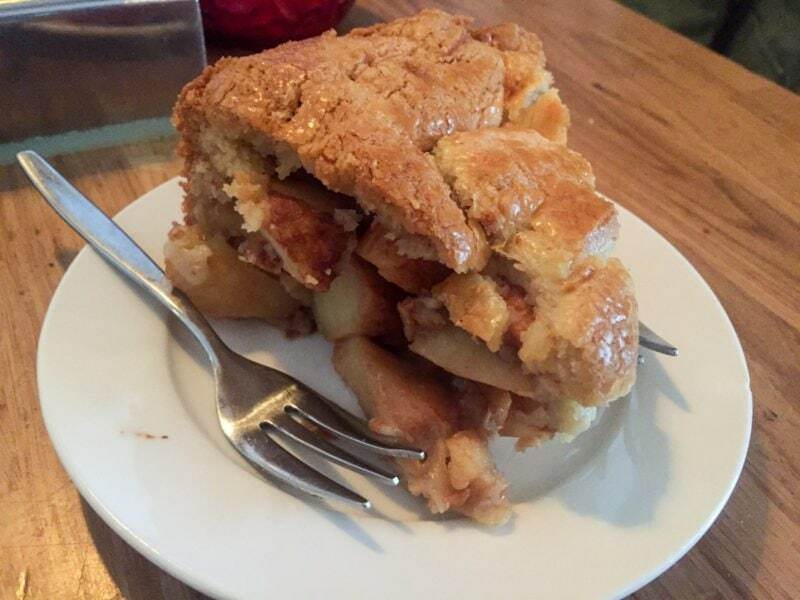 After you wrap things up at Anne Frank House, head over about 0.25 mile to Winkel 43 for a light lunch and hearty helping of their famous Dutch apple pie. This pie was out of this world – we enjoyed it so much that we went back another day for seconds! 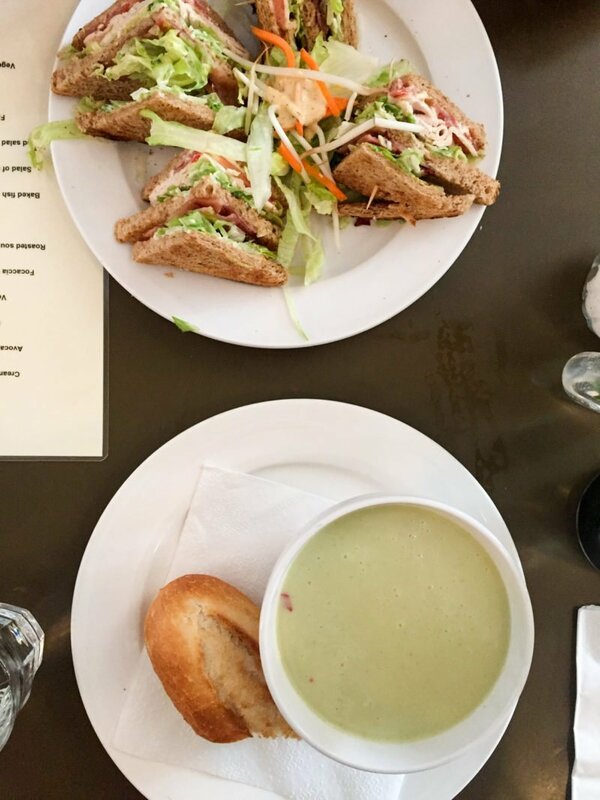 We split the turkey club and chilled avocado soup for lunch and had pie + coffee for dessert. The pie crust has an extremely buttery flavor and almost cake-like crumb – very unique. This restaurant gets pegged for often being crowded and having a wait. However, we went right in and sat down inside on a weekday around noon. Spend your second afternoon perusing the streets of the Jordaan – there’s many quaint little shops and historical buildings to be discovered here. Once you’ve had your fill of exploring, head to dinner at La Perla. 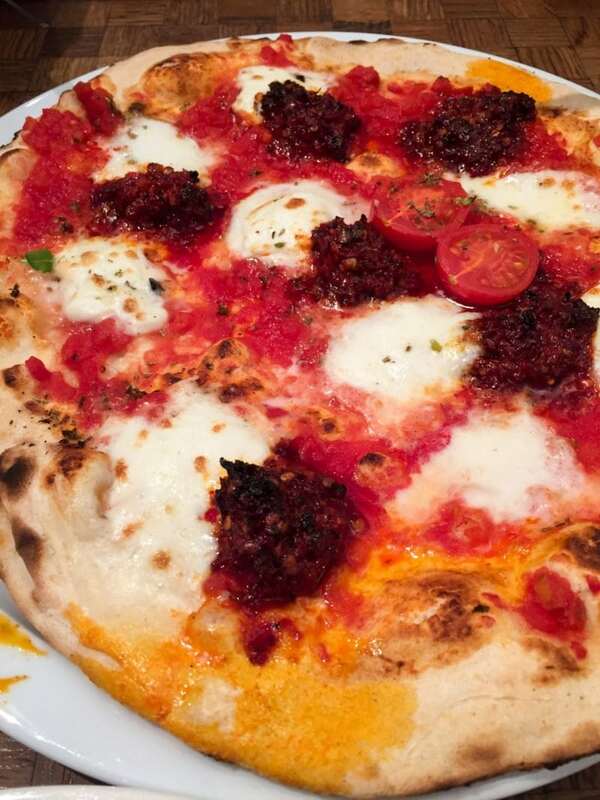 Here you will find Neapolitan-style, brick oven-fired pizza at its finest – just like they make in Italy. 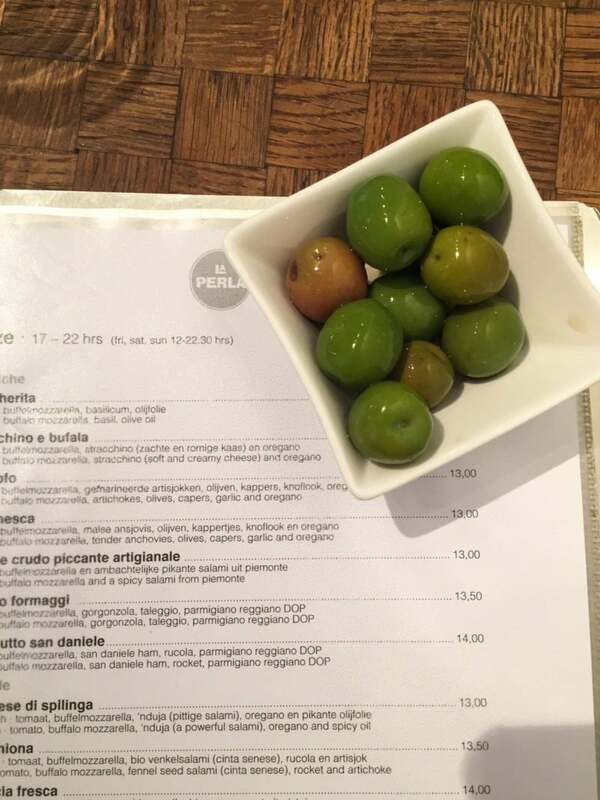 The complimentary olives are to die for – these were the freshest olives I had ever tasted and I loved their almost crunchy-like texture. La Perla serves some delicious looking desserts as well – but if you’d rather opt for something different there’s a little gelato shop just down the street (take a right out of the restaurant and it will be on your right). 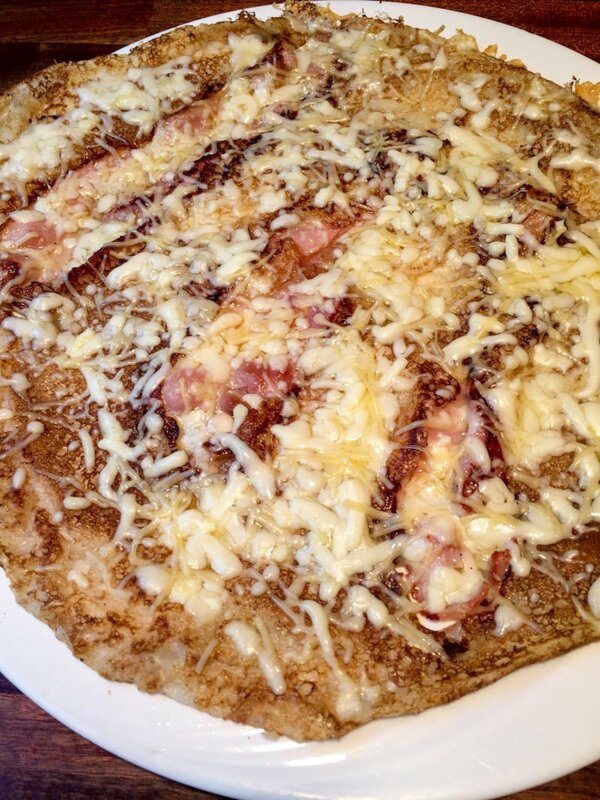 You can’t wrap up your time in Amsterdam without trying some traditional Dutch pancakes. There are more like crepes, but very unique. We opted for brunch at The Four Pillars. This historic little restaurant used to be a traveling food cart with the circus back in the day. The decor inside looks like it belongs in your 90+ year old grandmother’s house, but don’t let that put you off. You are in for a heavenly, buttery treat here! We ordered café Americano (the closest thing you can get to American-style drip coffee), split a Dutch pancake with bacon and cheese (sooooooo good), and then split a small order of poffertjes. These are puffy, silver dollar-size pancakes that are drizzled with butter and powdered sugar and are a Dutch specialty. 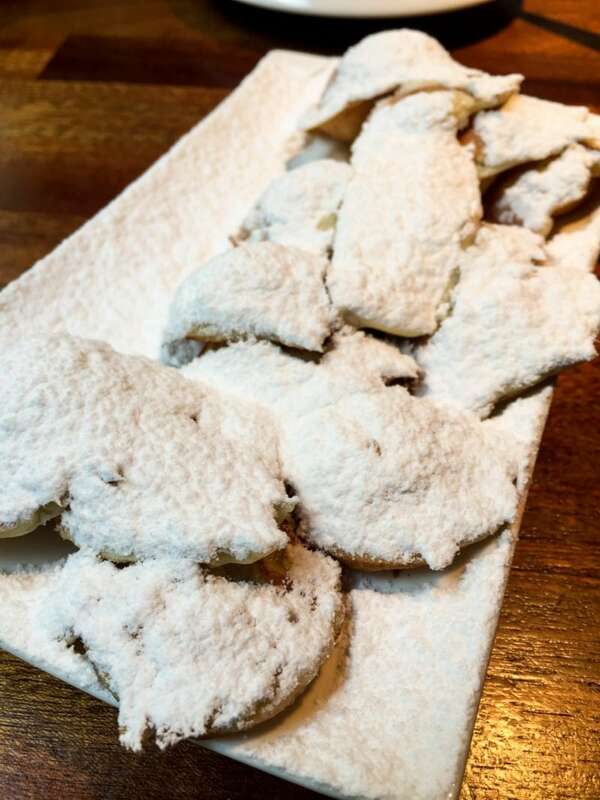 They are little clouds of heaven and oh-so-delightful with coffee; so be sure to try some! 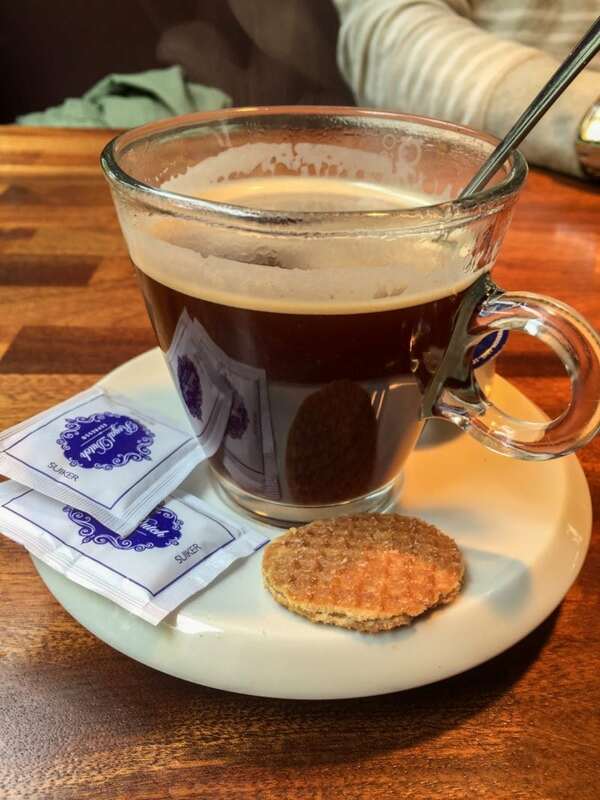 Once you have filled your belly with coffee and pancakes, head over to the Van Gogh Museum. It’s €17,00 per adult, and I highly recommend ordering/printing your ticket for this before you arrive in Amsterdam. The lines can be quite long. This museum is situated right next to the famous Rijksmuseum, which is often packed with tourists. We opted for the Van Gogh because it’s a little quieter and less crowded. This was a great choice, because the way the museum is set up allows you to really see the progression of Van Gogh’s work. The way the paintings change as Van Gogh makes his descent into the insanity that ultimately took his life was fascinating. After the museum, have a late lunch in the streets of downtown Amsterdam. 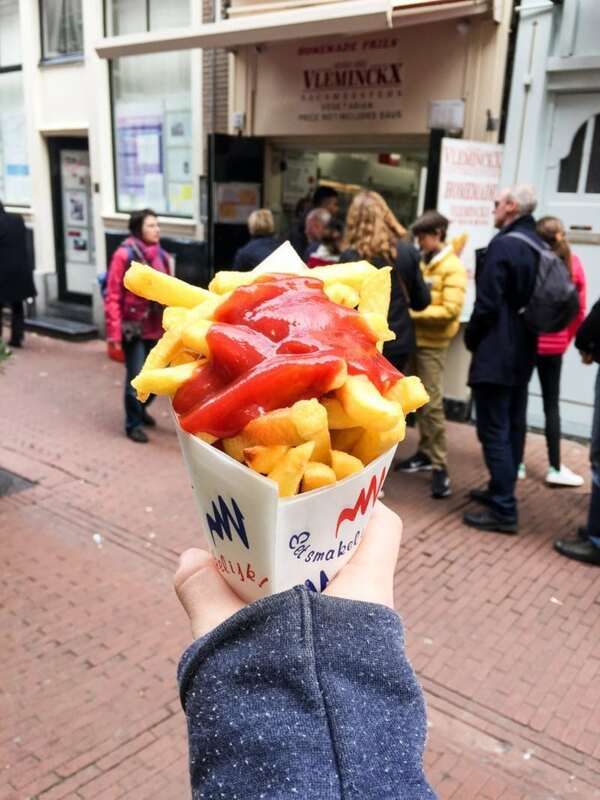 The frites from Vlaams Friteshuis Vleminckx are not to be missed (despite the lines) fresh herring from a nearby street stand makes for an authentic Dutch foodie experience. 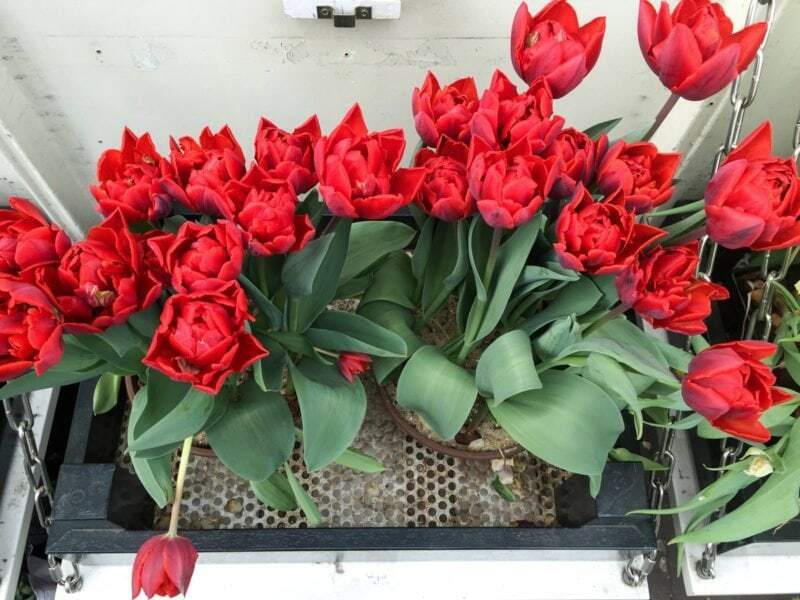 If you opt for the frites and herring, be sure to checkout the nearby Tulip Market that lines the canals. You won’t believe all the bulbs that can be purchased! Be sure to ask the merchants if the particular bulbs you want can make it through US customs though. Dinner can be a wild card – our last dinner in Amsterdam was unfortunately not the greatest (service was very poor). 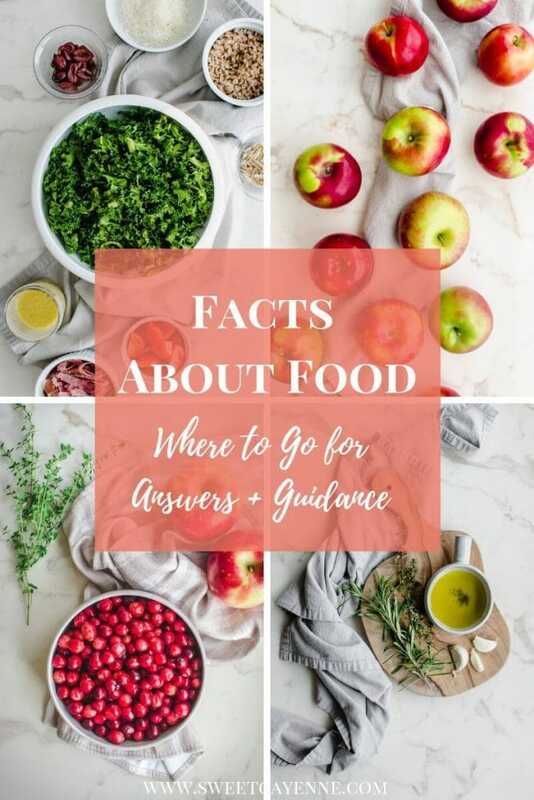 Ask a local what they like – I’ve found their recommendations are usually the best! 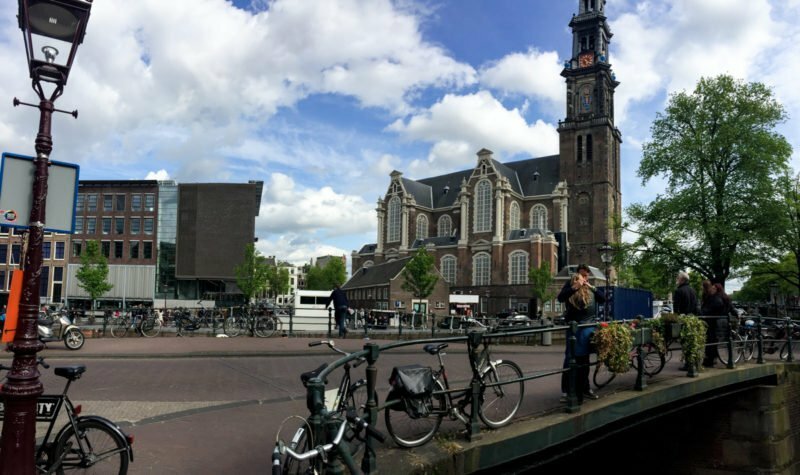 I Am Amsterdam proved to be invaluable to me in planning this trip. I’ve never encountered such a well-organized, user-friendly and helpful tourist site. You can get lost here, but certainly be sure to comb through all the information offered to plan your best possible trip. How to Navigate Through a City with Trip Advisor – this was invaluable in helping us make our way around the city. 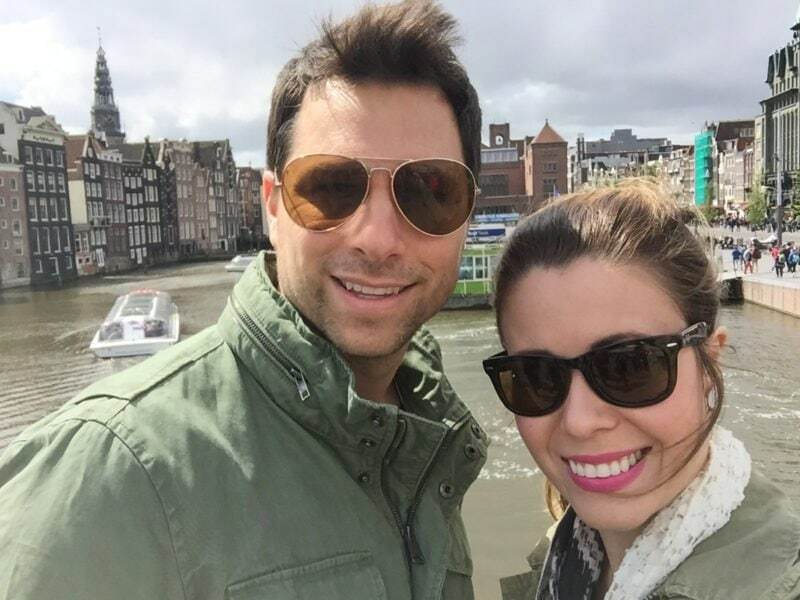 Have you ever been to Amsterdam? What are some of your favorite memories or recommendations? 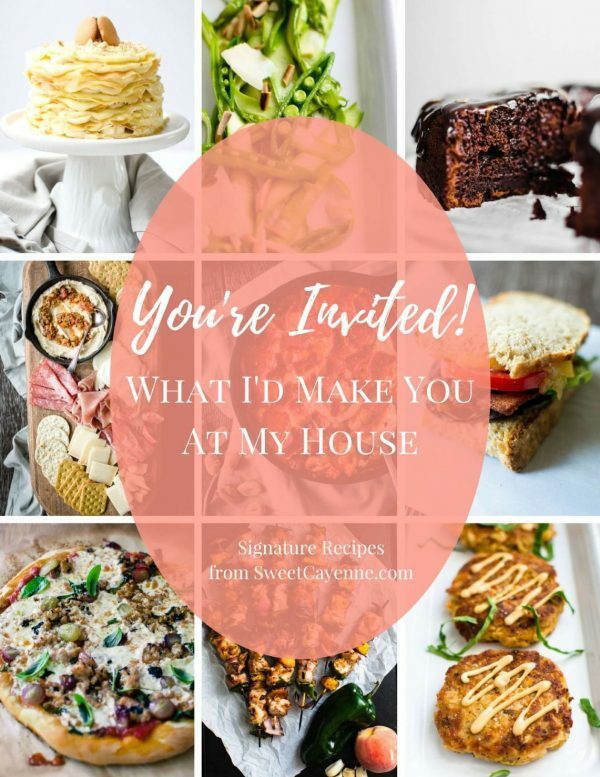 Leave a comment below and let me know!